The 312th Annual Meeting of the Philadelphia Baptist Association is fast approaching. 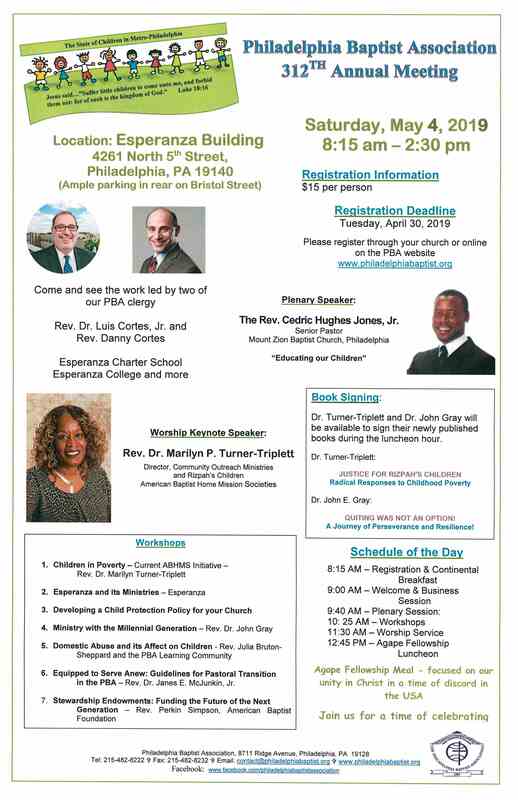 We will gather on Saturday, May 4, 2019 from 8:15 am to 2:30 pm at Esperanza (4261 North 5th Street, Philadelphia, PA 19140.) The Rev. Dr. Luis Cortes, founder, president and CEO of Esperanza, is our host. Registration cost is $15.00 per person. The deadline for registrations is April 30, 2019. 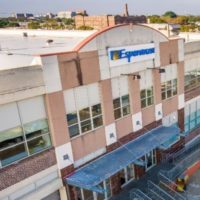 The Esperanza mission began in the basement of First Spanish Baptist Church in Philadelphia and it is now a leading faith based community organization for the Puerto Rican community reaching across the United States. This is a special invitation to you and your church to join us as we celebrate three hundred and twelve years as an Association! We will have a time of fellowship, brief business discussion, informative workshops, inspiring worship and a special Agape fellowship luncheon. Our Plenary Speaker is The Rev. Cedric Hughes Jones, Jr., Pastor of the Mount Zion Baptist Church in Philadelphia. Rev. Jones will set the tone for the day as we reflect on our theme for the day, “The State of Children in Metro-Philadelphia.” Rev. Jones will speak on the topic of ‘Educating our Children.’ The Rev. Dr. Marilyn P. Turner-Triplett, Director, Community Outreach Ministries and Rizpah’s Children, of the American Baptist Home Mission Societies, is this year’s worship speaker. The workshops will focus on ministries with children and other pertinent ministry topics. We look forward to greeting you at the Annual Meeting on Saturday, May 5th.